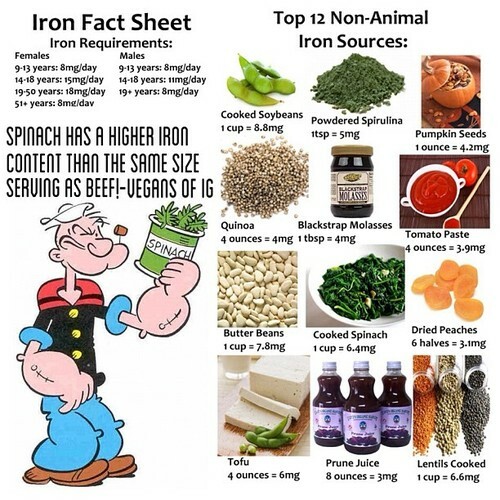 It is not uncommon for vegetarians, especially active female vegetarians, to suffer from anemia – low iron counts. Low iron and anemia can mean increased fatigue and exhaustion. The human body stores some iron to replace any that is lost. However, low iron levels over a long period of time can lead to iron deficiency anemia. Symptoms include lack of energy, shortness of breath, headache, irritability, dizziness, or weight loss. Eating red meat and organ meat are the most efficient ways to get iron, but for us plant based eaters, obviously, that’s not going to happen. 1. Sweet Potato – A great way to incorporate a sweet touch into your savory meal, sweet potatoes are enriched with both iron and B-6 – a vitamin known to prevent over 100 health conditions, especially those related to the brain and heart. 2. Lentils – Like other beans, lentils are a great source of iron, but what sets the lentil apart is their protein content: 16 grams/ serving. 3. Dark, Leafy Greens – Spinach, Collards, and Chard are three easy greens to throw into your dinner or add to your smoothies to boost iron levels. 4. Nuts and Seeds – These two food groups are a vegetarian must-have. Nuts and seeds contain natural fats as well as high levels of iron. Sesame seeds, pumpkin seeds and pine nuts contain the highest levels of iron in their respective food groups. A handful of nuts or seeds on a busy day is a great way to get your iron, and fuel your body. 6. Blackstrap Molasses- is the dark liquid byproduct of the process of refining sugar cane into table sugar. Sugar has hardly any nutritional value because all of the nutrition is in the blackstrap molasses. It tastes best added to coconut milk and almond milk it actually makes them taste even better as a result it’s a wonderful flavor mixture. 7. Raw Cacao – Calling all chocolate lovers: raw cacao is 16% iron, and is an indulgent way to get your daily fix. You can find these at any health food store. Cook in iron pots. The acid in foods seems to pull some of the iron out of the cast-iron pots. Simmering acidic foods, such as tomato sauce, in an iron pot can increase the iron content . Cooking foods containing other acids, such as vinegar, red wine, lemon or lime juice, in an iron pot can also increase the iron content of the final mixture.